Showing results for tags 'Mistel'. 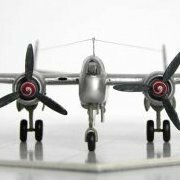 MustHave Models has just release a 1/48th Mistel Junkers Ju-88/ Messerschmitt Bf.109 (ICM plastic with resin bit???) kit - ref. MHI48006 Sources: https://www.facebook.com/permalink.php?story_fbid=764911993714937&id=297895983749876 https://www.musthavemodels.fr/e-boutique-1/#cc-m-product-16466328025 V.P. Mistel V using the DML carriage and bomb, and a HUMA Junkers EF.128 jabo in place of the Salamander. Kora Models has just released a 1/72nd Hirth Lastenträger (resin) & Messerschmitt Bf.109G (AZmodel) in Mistel configuration - ref.72019 Source: https://www.lfmodels.com/index.php?main_page=product_info&products_id=2351&zenid=56lk5f17ssm86s4aj36k7tvfi2 Box art V.P.